The Music Box Shop, UK, music boxes, jewellery boxes, Reuge music boxes, music box gifts, carousels, musical, instruments, organs, Dean. 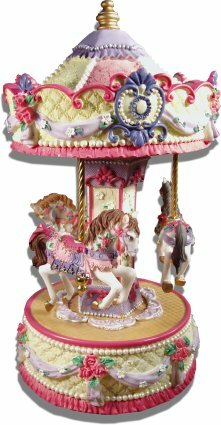 This music box carousel has 3 miniature horses. It is painted in pretty pastel shades of pink, lilac & purple. The clockwork musical movement is fitted into the ornate top and when wound, gently rotates and carries the horses around to the music.